Mobile RxTrax is a modern web based portal and hosted software application designed specifically for the pharmaceutical industry that provides the most important aspects of Customer Relationship Management(CRM) systems and blends them with a fully compliant, comprehensive Sample Management(SM) solution that is ready to drive your Sales Force Automation(SFA) initiatives. MRxTrax is a state of art web based portal and hosted software application designed specifically for the controlled product industry that provides the most important aspects of Customer Relationship Management (CRM) systems and blends them with a fully compliant, comprehensive Sample Management (SM) solution that is ready to drive your Sales Force Automation (SFA) initiatives. • Sales Organization Management Tracks current and historic sales representative roster and territory information. • Communication Management MRxTrax provides facility to send messages internally in the organization for meetings and provide an interface for communication among users. • Profile Management Manages complete customer profiles and territory alignment data and maps location. • Call Management Collects all call details and sampling activity from paper and electronic sources. • Sample Activity Management Tracks and reconciles all sample inventory events to meet FDA requirements, capture the sample receivers digital signature and provide functionality of visual verification of same person signature. • Analysis Manager MRxTrax provides powerful dynamic analyzer for all analysis requirements. 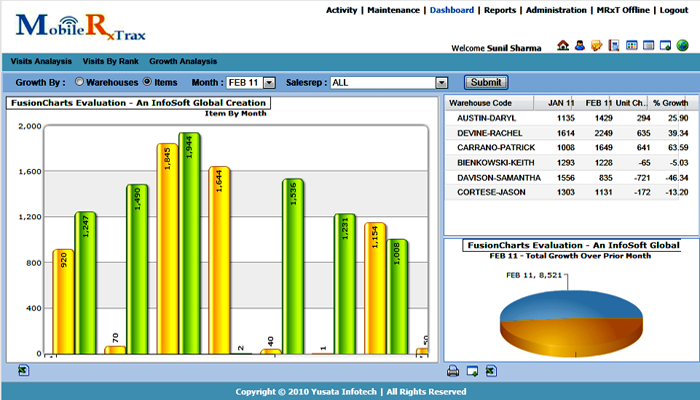 Represent data in tabular form with interactive management dashboard charting. • Report Management Provides powerful reporting tool to generate reports and analyze your data to schedule reports. • Users login to access the portal. The authentication mechanism is customizable for your needs. The portal supports the secured SSL protocol. • Zero Internal IT support or Infrastructure, necessary and redundant services, 24 X 7 uptime remote Access. • Help Desk User friendly with online visual Instructions and help desk support. • Robust Oracle database, integrates with a variety of administrative and technology applications. • Modular A modular architecture allows you to cost-effectively implement only those aspects of MRxTrax that your company needs. MRxTrax is so efficient and easy to use as it allow you to handle many functions internally that previously needed to be outsource. 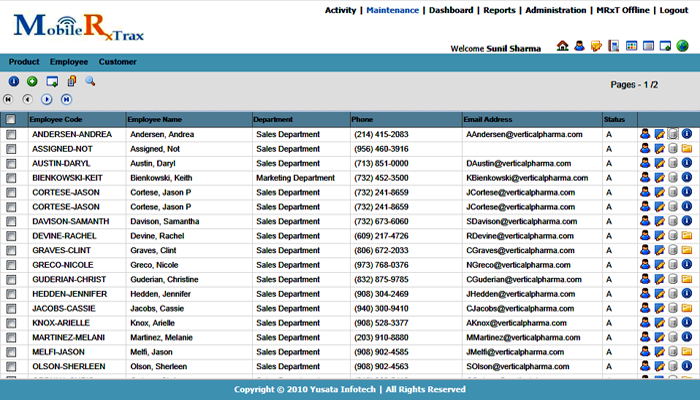 • Comprehensive MRxTrax provides integrated rep roster, territory management, professional management, alignments, sales activity tracking, sample reconciliation, and a multitude of other critical data management functions that every pharmaceutical sales organization needs. • Unique - MRxTrax takes the important elements of traditional CRM packages (such as the ability to track all points of contact with a customer) and blends them with a first-rate, fully PDMA compliant sample accountability solution. • CompliantMRxTrax was designed to comply fully with all applicable federal and state regulations, including Audit trails, time stamping, state license validation, lot tracking, loss recording, and all other FDA requirements are addressed fully and handled efficiently. • Supports remote content feeds. 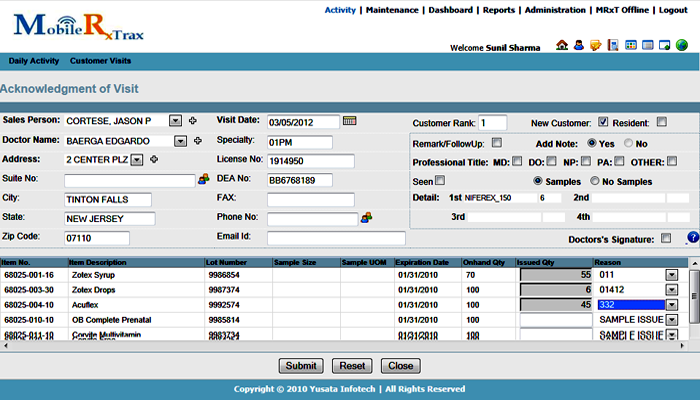 Mrxtrax provides the deatils of with items status, current appointments of sales rep with customer and visit details of sales rep. It also provides the deatils of overdue visits. Dashboard provides graphical view of item sales data periodically which provides a easy way of data analysis. It also provides data of items grouped on warehouses periodically. It provides activity deatil of sales rep whom the sales rep visit along with the item deatils that depicts his sales information and data. 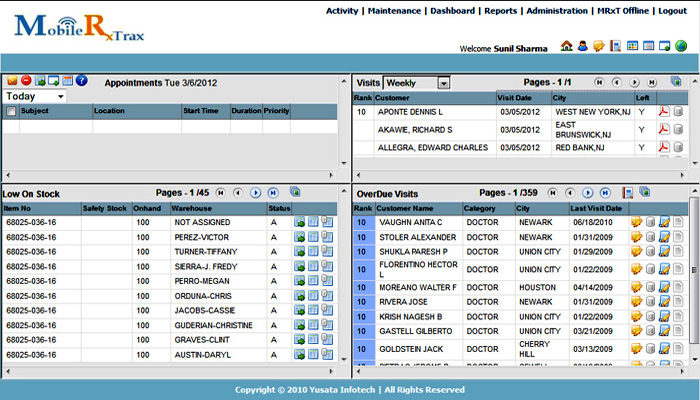 Employee detail screen that provides status, address details, contact details of an employee. Mrxtrax provides the deatils of with items status, current appointments..